The problem comes in when this natural behavior collides with our living space. While some cat guardians have resigned themselves to living with scratched furniture, sometimes “sacrficing” one piece to the cats, there are other ways to protect your furniture, and still let your cat be a cat. 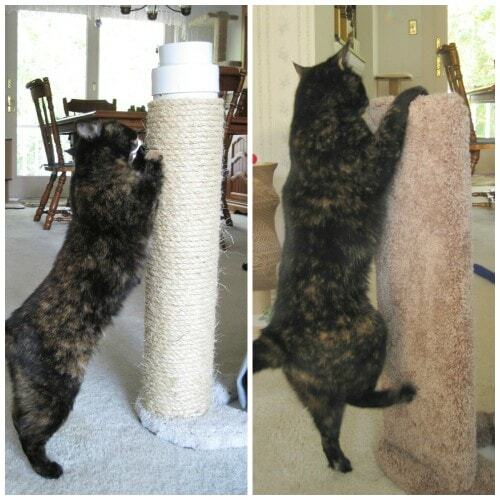 Enter the Furniture Protector Cat Scratchers by Kool Kitty Toys. These patent-pending scratchers are cleverly designed to protect furniture. 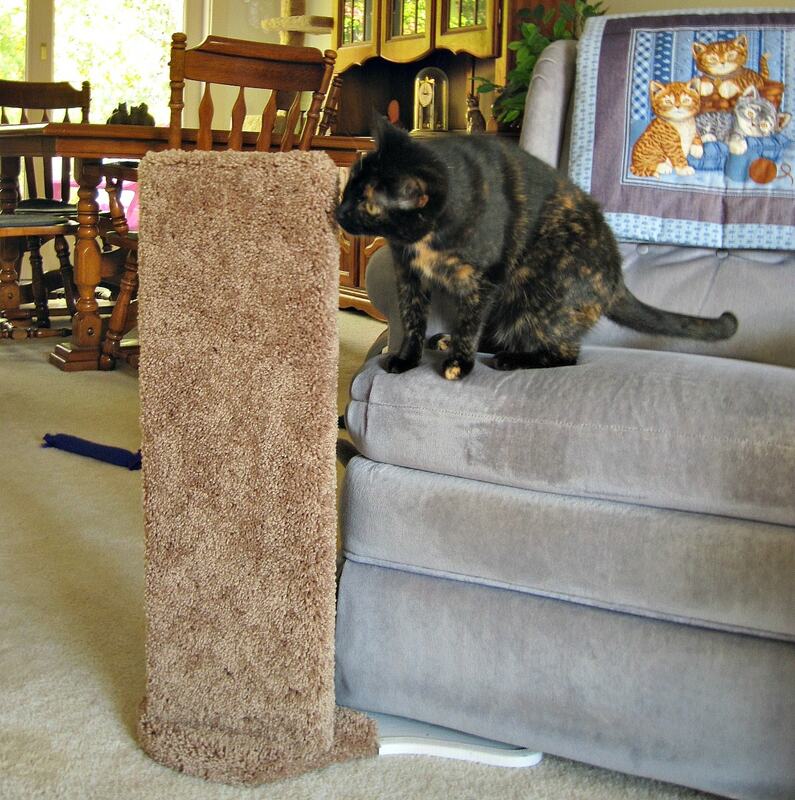 The scratcher slides under the leg of a chair, couch, table, or other piece of furniture and turns the corner of the piece into a scratching post. 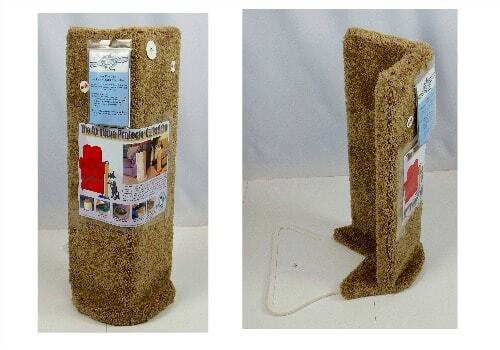 The scratchers come in two versions: sisal and carpet, to cater to your cat’s preference or to offer a variety of scratching surfaces, which is always a good idea. I placed the scratchers near a rocking chair for getting photos for this review, and I didn’t slide it all the way up to the chair so it could still move, but as you can see from the photo above, the carpet version is designed to completely cover the edge of a sofa or chair. There will be a slight gap with the sisal version. 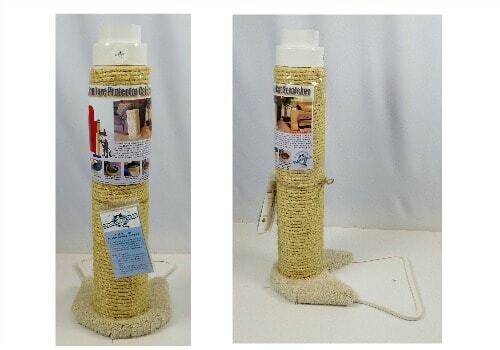 This sisal version features a removable lid which lets you add fresh catnip into the cylinder. Kool Kitty Toys uses unique catnip filter packs. And as an added bonus, the lid doubles as a beverage holder. Allegra and Ruby both loved the scratchers, with a slight preference for the sisal version, which is what I expected. Neither of them particularly likes to scratch on carpet. At 29 inches high with a 4 diameter post, these scratchers are solid. I also love that they’re tall enough so cats can get a really good stretch. Between the heavy weight (they weigh in at 10 pounds) and the fact that they’re anchored under a piece of furniture, even large cats won’t be able to topple them. You can choose from a variety of materials and colors, and Kool Kitty Toys will even customize the scratchers. For more information and to purchase, please visit http://www.KoolKittyToys.com. Kool Kitty toys donates a portion of all sales to several pet rescue and anti-declawing organizations. I am very impressed with the scratcher too. It’s working really well at my house. This looks like a great way to handle a difficult habit to break when directed at furniture. You could move it further away from the couch or chair in small increments, until it’s far enough that the cat is not near the furniture any longer, and doesn’t try to scratch where not wanted. Good positive reinforcement! 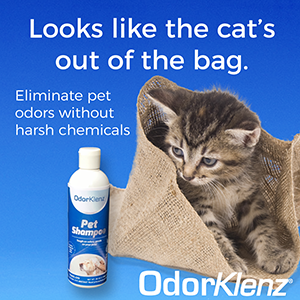 We have very polite kitties but if this was an issue here I would buy this for sure. Those look really cool! Maybe my human should get one for when we travel.